Who does not want to wander like a free bird? At the bottom, we are all but wanderers... looking for something special that we keep looking unless we find it. Very few, though, find that 'special' thing. That special thing, if we see it objectively, is the very purpose of our life. Questions like why I love somebody; why do I care for that person; why do I earn money; why should I save for my days in future and many others... all lead to a single, the core, the ultimate quest - a quest for truth. 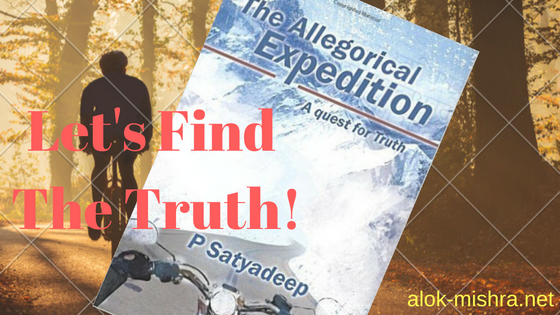 And that is quest is very well explored and answered in a very fine book by P Satyadeep: The Allegorical Expedition (which is subtitled 'A quest for truth'). The book is author's debut novel and he does show a true balance between the narration and the theme of the book. Let's explore more of it. This is the story of Satyajit, a successful movie director. As happens with most of the people with nothing more left to achieve, SJ (Satyajit) also develops a sense of disillusionment towards the world. He becomes a little itchy, hurried and to an extent - frustrated as well. The frustration holds him of making 'yet another' movie with the same drab - theme of modern romance and a few tragic tears to shed. He looks for something 'extraordinary' and sets on a trip to find his impulse. And this 'expedition' is the major highlight of this novel The Allegorical Expedition. 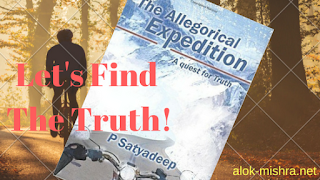 The plot revolves around Satyajit and his intellectual encounters with other characters in the novel. There are some of them; however, most important ones are - Panditji and Maaya. One is related to SJ and another is the centripetal force during the expedition which introduces SJ to a manifold of issues. And the story ends with SJ being even more famous for his new movie and it breaks all the box office records. However, at the end, he moves out again on an expedition with no details where and why does he leave (possibly for a sequel). But, in between, there are many things that will interest the readers and keep them enraptured thoroughly. The movie the film director SJ makes re-tells the mythological stories. The stories of Saudasa, Vasishta, Yamraaj, Sri Vishnu and many others are revisited in the course. The major happening is the way in which SJ is introduced to these stories. Moreover, en route his movie plot, he also unfolds many stories that instruct him about the life in general. Thus, the journey becomes pretty much 'allegorical' as we see in the title of the book itself. He learns many lessons about 'monkey mind,' rebirth of the mind, wilderness, 'who art thou' and many more such questions are answered in his own contemplation as well in the form of answers coming from Panditji and others. The setting of the novel is in far lands, far from the sad cityscape, you will feel transported to a freshness. To conclude, The novel by P Satyadeep is a fresh addition but not a naive one. If you are reading the contemporary pieces, you will easily get to know what is the difference between a regular novel and a different kind of novel. In fact, as the character SJ does something different in the terms of his movie, the same has been done by Satyadeep in the terms of the novel. Thus, the term 'allegory' can serve as a pun as well. My advice - read it once and you will like it. Read it twice and you will love it! Happy reading folks!